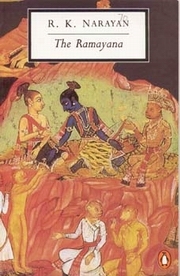 A shortened modern prose version of the Indian epic. The Ramayana is, quite simply, the greatest of Indian epics—and one of the world's supreme masterpieces of storytelling. ‘Almost every individual living in India,' writes R. K. Narayan in the Introduction to this new interpretation, ‘is aware of the story of The Ramayana. Everyone of whatever age, outlook, education or station in life knows the essential part of the epic and adores the main figures in it—Rama and Sita. Every child is told the story at bedtime… The Ramayana pervades our cultural life.' Although the Sanskrit original was composed by Valmiki, probably around the 4th century BC, poets have produced countless variant versions in different languages. Here, drawing his inspiration from the work of an eleventh-century Tamil poet called Kamban, Narayan has used the talents of a master novelist to recreate the excitement and joy he has found in the original. It can be enjoyed and appreciated, he suggests, for its psychological insight, its spiritual depth and its practical wisdom—or just as a thrilling tale of abduction, battle and courtship played out in a universe thronged with heroes, deities and demons. R.K. Narayan (1906-2001) was born in Madras and educated there and at Maharajah's College, Mysore. His first novel was 'Swami and Friends' (1935). In 1980 R.K. Narayan was awarded the A.C. Benson medal by the Royal Society of Literature and was made Honorary Member of the American Academy and Institute of Arts and Letters. In 1989 he was made member of the Rajya Sabha. In 2000 the Padma Vibhushan was conferred on him. The novelist places himself firmly among the ordinary people, breaking down the boundaries between the real life outside his fiction and the life within the fiction. Narayan's small town and its characters have a universal appeal.